Bradford City displayed all of their weaknesses again in an afternoon that showed exactly how much work David Hopkin has to do to get this team competitive. A battling showing, combined with a bit of luck had the team 2-0 up but a panicked and chaotic finish meant that they threw away the game. Hopkin lined the team up in a 5-3-2 system with Nathaniel Knight-Percival recalled and Connor Wood at left wing back – in many ways similar to the system that Simon Grayson tried to implement last season. What was also similar was the way that the ball was launched forward to an isolated front line, but without a Charlie Wyke-style target man it predictably came straight back again. As a result City couldn’t keep the ball well enough or get it to the forward line in dangerous areas. Jack Payne looked bright when he got the ball but this was not often enough, and when Blackpool came forward they had a lot of joy. They didn’t have much success against Connor Wood, who had a promising debut at left wing back, but when they went down the other side they went past the dreadful Kelvin Mellor time and time again. There was a steady stream of crosses from that flank and while the centre backs dealt with them fairly well, Richard O’Donnell was called into action on several occasions. The midfield was often bypassed and mostly anonymous, but Josh Wright caused a couple of wobbles defensively by being sloppy in possession. 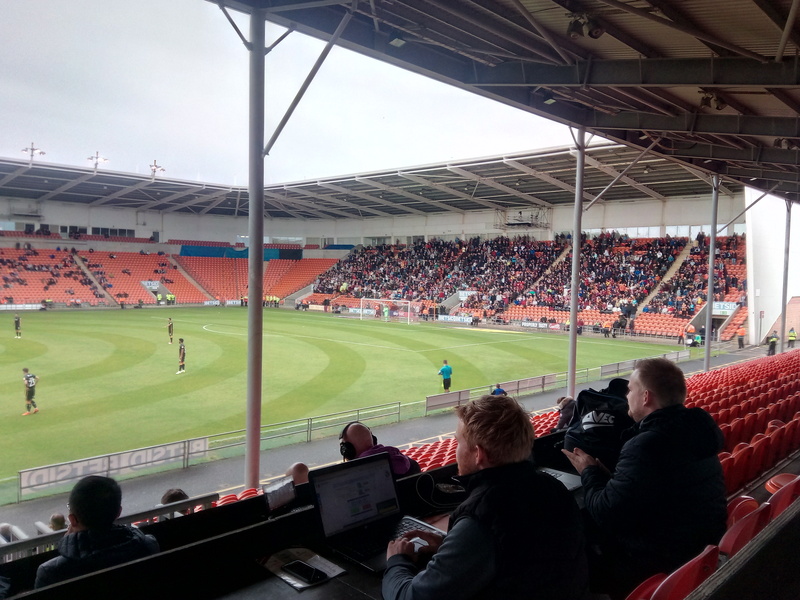 The second half was much the same as the first, with Blackpool causing problems and their impressive left back Marc Bola giving Mellor a torrid time. But just as City looked to be overwhelmed, they suddenly got a stroke of fortune. They won the ball back high up the pitch and, through some smart link play, got it to Mellor in the box. He was carelessly brought down, Doyle fired the penalty in and suddenly City had a barely deserved lead. Five minutes later it got even better. Blackpool stood off Doyle as the ball was launched forward and his clever header found substitute David Ball. Ball slipped it through to Payne, who twisted, turned and fired it in for 2-0. It was smash and grab, but we’d take it. From here, you’d expect a Phil Parkinson team to shut up shop and kill the game professionally. A Stuart McCall team might try to close the game out by keeping possession. But this team panicked. It launched the ball forward and again it came straight back. This is a team without a recognised target man – what did we expect to happen? It took some excellent keeping by O’Donnell and a goal line clearance to keep it 2-0, while on the counter City had one good chance to seal it through Ball. But eventually the increasingly panicked defending and individual errors cost us. The defence missed a simple long ball, O’Donnell misjudged it and brought the striker down. Penalty. 2-1. A few minutes later City lost it carelessly in midfield, Blackpool broke, McGowan recklessly dived in and it was another penalty. O’Donnell did well to save but Spearing scored the rebound. And to top off this display of witless football, a cross came in unchallenged from the right, O’Donnell dropped it at the feet of Curtis Tilt and it was 3-2. It’s clear that Hopkin has a lot of work to do with this squad, and without a target man his preferred direct style is unlikely to work. This begs the question of why we have recruited a head coach seemingly not suited to the squad that has been signed when we cannot sign players for four months. This is not how the continental model of a Director of Football and Head Coach is supposed to work – the Head Coach should be someone suited to bringing the best out of the existing players, not someone who needs an entirely different sort of footballer to make his tactics work. This happened last year with Simon Grayson’s style not being suited to a squad that Stuart McCall had done well with, and I fear it could happen again in spite of Hopkin’s qualities as a coach. There were some positives that could be taken from the early second half performance. David Ball looks like a good signing and linked well with Eoin Doyle and Jack Payne, while Payne himself was our most dangerous player. Nathaniel Knight-Percival had his best game for months and Connor Wood was fairly impressive in his first start. However, there are some serious issues with this squad. The right hand side is a worry, with Riley unconvincing so far and Mellor really struggling for form, and there’s a major issue with squad depth. There was only the aforementioned Ball as an experienced option on the bench and our central midfield cover is so thin that we ended up playing Jordan Gibson out of position there. It’s going to take time and patience to turn this side around – and possibly another couple of players. The squad is short on confidence and composure and worryingly thin in some positions. David Hopkin will need time and support – and it is up to the club to give him that. THROWN away by a team who have had the confidence ripped out of them by RAHICs meddling!!!!! Where’s Stephen Darby when you need him? Where’s Darby, McCardle, McMahon, Meredith, Killa, Marshall, Wyke, Clarke – the list goes on and on and on – when you need them. The Rahic effect continues. It’s going to take a massive turn round to get us back on to some sort of equilibrium and then start to climb back to where we were before this idiot attempted his games with us. He should be matched to the Bradford boundary and forced out of our city forever. More damage done in six months than in the history of our club and it’s all down to one man. The worrying thing, Mark, is the man appears oblivious to the carnage he’s caused. It appears nothing will bring him to his senses. It’ll always be “someone else’s mistake”. I know your feelings on Mr Rahic from FB Mark, but as mentioned on that forum we need an alternative if ER is to be replaced – on FB you said there were people who were keeping a close watch on the situation, do you think this is progressing in any way? Unfortunately one of the two has lost interest. He ran the story of his interest a few weeks ago but the response of the fans disappointed him. I rather think if the same story was repeated now there would because more encouraging response but it seems to be ended now. Just bought a mountain bike with next seasons ticket money, my Saturdays are now sorted. On the team you support? Andrew’s comment is very relevant to the current situation. If ‘Uber’ fans such as yourself are not concerned that the current ‘regime’ are driving away supporters….some of whom have being attending games since the 50s and 60s due to their questionable then your actually part of the problem. Danny Devine no mention of him. Chris Wright. You are absolutely spot on. The club, Edin and other fans show no concern that we are alienating fans, some of which are long standing supporters who go back to 1960s/70s. Surely Rahic should be trying to find the reasons why so many fans feel like they do a address the problem.i realise he does not care about the club or nderstand the relationship it had with the fans, but surely he understands lost revenue. If the same loss occurs next close season and we lose more season ticket holders then I believe their will be severe repercussions on the club. Uber is German for above. So thanks for the compliment on being an uber fan. My concern is that Unter fans (german for less than) see that the solution to the problem is to stay away and boast about it. Going mountain biking does not solve anything. Supporting the team while holding negative views on Rahic is fine. How about a reply defending Rahic against the accusations put against him rather than sarcastic replies to genuine concerns, say’s it all really. How many season ticket holders would have renewed if this article had been published several months ago? Many supporters have expressed the opinion that the club is “rotten to the core”. It’s hard to disagree with them, based on this article. The prospect of mountain biking with Andrew, on a Saturday afternoon, sounds a lot more appealing than lining the pockets of these owners. I am, of course, referring to the Daily Star article.